Q: What waterways do I have access do when cruising on Kangaroo? A: From her base in Newport, you have ready access to the sheltered waters of Pittwater and, weather permitting, Broken Bay, the Hawkesbury & Cowan Creek. This vast and majestic area is a cruising paradise. Q: Do I need a boat license to skipper Kangaroo? A: No. You don’t require a boat license, however you do require a briefing, to ensure you are all set to cruise safely and comfortably. We also supply on-board documentation including maps for your reference. Q: Is a dinghy included? A: Yes, our dinghy ‘Joey’ is provided as part of the charter. An outboard motor can be hired and fitted on request. Q: What is the sleeping configuration aboard Kangaroo? A: Kangaroo has 9 potential berths, consisting of 7 single berths (3 king single bunks in the Forward Cabin, 2 king single bunks in the mid-cabin and 2 single berths in the cockpit) and 1 double berth in the main saloon (dinette conversion). However, we limit the number of overnight passengers to 7 in total, in the interest of overall comfort and wear & tear on the old girl. Q: What is provided aboard Kangaroo? A: Kangaroo is fully equipped to cater for groups of up to 10 passengers, with sufficient cutlery, crockery, glassware, tea & coffee pots, kettle, saucepans, frying pans, plastic ware, chopping boards and a large collection of kitchen utensils – just as you would find in your own kitchen at home. Other provisions include dishwashing liquid, dishcloths & brush, disposable gloves, cling film, foil, kitchen towel, tissues, toilet paper, hand wash, sunscreen and first aid items. On-board water is safe to drink. You’ll also find a small selection of books, board games and cards on-board. A: You need to bring linen, bedding or sleeping bags, pillows, towels, personal items, food and drink, entertainment such as books, board games, CDs & DVDs. Be reminded when packing that storage and hanging space is limited and only soft bags should be used rather than suitcases. Non-slip, non-marking shoes are recommended for safety on board. Q: Is there a good refrigerator? A: Yes, there is a eutectic front-loading fridge/freezer in the galley and another top loading fridge in the stern area. Q: What is eutectic refrigeration? A: Eutectic refrigeration is the most energy-efficient and performance-effective refrigeration system in 12VDC. Eutectic fluid surrounds the four walls of the interior cabinet, acting as an “ice bank” or cold storage compound, for the contents of the cabinet. Once the eutectic fridge has been pre-chilled, the eutectic system need only be run for a few hours per day to maintain the desired temperature – even in ambient temperatures of 32°C+. Q: What cooking facilities are available? A: The gas stove has 2 large stove-top burners & a small grill. A: With her spacious interior, Kangaroo is suitable for children as long as they are supervised. Children are not required by law to wear a life jacket on board however we recommend that young children wear a life vest when outside the cabin area. Church Point Charter will fit and supply children’s lifejackets to all hirers upon request. Be aware that the bunks do not have safety rails so may not be suitable for some children. Q: What safety equipment is installed on Kangaroo? A: You can be confident that Kangaroo meets the rigorous safety requirements of the NSW Maritime Survey. Safety equipment includes life jackets, life buoys, throw line, fire buckets, fire extinguishers, fire blanket, air horn + spare canister, emergency navigation lights, stay plug, first aid kit, floating torch, flares. Q: Use of life jackets? A: It is a legal requirement that when children under 12 years of age are in a dinghy they must wear a life jacket at all times. Older children and adults are required by law to wear a life jacket if alone in the dinghy or at night. Everyone must wear a life jacket when more than 200m from shore. Life jackets are provided and child-sized life jackets are available on request. Q: Is there parking at the marina? A: Mobile phone coverage is very good throughout Pittwater but can be less reliable within the Hawkesbury & Cowan waterways….but that can be a good thing….you are on holiday after all…. Q: Can I use normal household appliances on board? A: No. You are not able to use household appliances. To maintain good power supply we recommend 2 to 3 hours engine running per day. Q: Is the cost of fuel included? A: No. Fuel consumption is charged on the number of engine running hours at the end of the hire. Q: Do you allow pets on board? Q: Can we eat out at restaurants while we are cruising? A: Yes. There are some fabulous eateries and restaurants in the Pittwater/Hawkesbury/Cowan area. We will be happy to provide you with some recommendations. Also see further information under Things to Do – Dining Out. A: No. All self-drive charter vessels are prohibited by law from travelling at night between sunset and sunrise. We request that Kangaroo is secured on an appropriate mooring buoy at least an hour before official sunset. Her anchor is only to be deployed in an emergency. Q: Are there any shops in the area? A: Newport and the even larger centre of Mona Vale just 5km further south, both have an excellent selection of shops. There is also a bottle shop at the Newport Arms Hotel. Ice can be purchased at a variety of outlets the area. Palm Beach has two general stores for basic grocery items; the first is opposite the wharf and the other — Palm Beach Cellars — is about 150m south. There are also restaurants, an RSL Club and a fish and chip shop in the Palm Beach area. Patonga and Cottage Point also have small stores. Q: Is there any music on board? A: Yes. Kangaroo is equipped with a multimedia entertainment unit that includes AM/FM radio, CD drive and MP3 player. It has SD and USB inputs plus iPod compatibility. Q: Can you recommend some good local information sources? 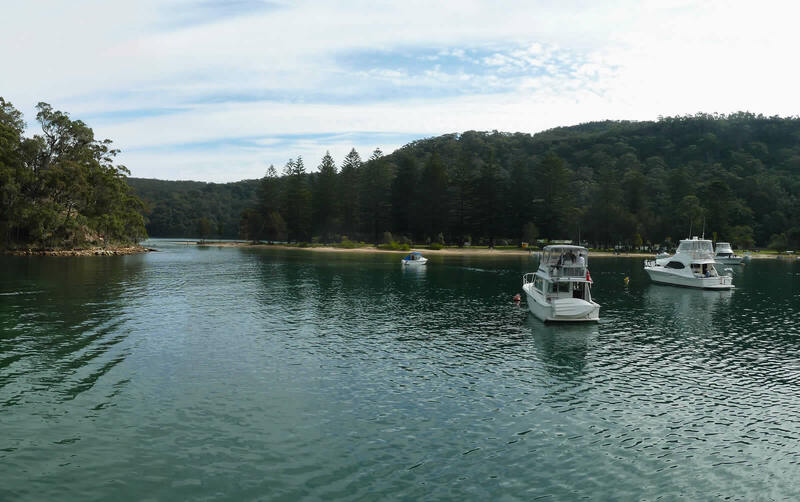 In–print: Cruising Guide – Hawkesbury River, Cowan, Broken Bay and Pittwater. 4th Edition by John & Jocelyn Powell (highly recommended). A copy is provided aboard Kangaroo for your reference during your cruise. Q: Where is the nearest Medical Centre to the marina? Q: Where is the nearest Hospital to the marina?